Our training teaches our Grads how to "think" like a Household Manager. How to quickly learn Employer's Service Standards and Household patterns. Tools to be both hands-on, and for managing staff. Starkey Service Management System and the Relationship of Service Education Certificate Programs! Enhance your Household and Estate Management knowledge through our Starkey's new short Programs! 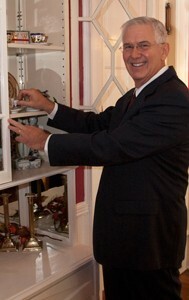 Household and Estate Management is one of the few service centered growing professions. Service as an Expertise! Enhance your home or career! Visit the Starkey Store for our full line up of Mrs. Mary Starkey's publications and our online courses. Avoid the "Crisis Mode" in your home. Our in-home Site Visits and Private Training brings our expertise to your home with customized service management training and education. Over 36 years of Placement Expertise! Looking for the ideal candidate for your home? 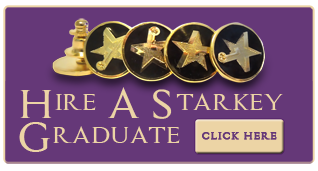 With Starkey's experience,trust in us to find you the perfect Graduate! The Starkey International Brand “Starkey Brand” has been carefully developed and promoted over the last 36 years to stand for quality and to specifically support our Graduates and those Principals that hire our Graduates. Starkey has been featured as the Harvard of Private Service on TV networks, in Publications, and other media for many years. Our Starkey Brand and Crest is well-known throughout the industry in the U.S., Canada, Caribbean, Europe and Asia as setting the Standard for Private Service. It is our commitment to creating a growing profession and knowledge that brings great value and expertise. Our educational courses and placement expertise have been fine tuned over many years, thereby proving our commitment to the Service Management Profession. We are considered a hybrid of sophisticated education in Household and Service Management. 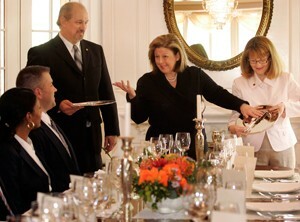 We have been positioned at the Master’s Degree level of education by our college administrative colleagues. We have focused on quality as opposed to quantity, and have continued to develop progressive and inspirational curriculums serving a highly varied American marketplace. Our Placement strategies have also been proven to be genuine and highly successful. We have published multiple text books, including our 704 page Original Guide to Private Service Management and others for both our Clientele and our Students, and patented our own Service Management System, Our “state of the art" , StarkeyHQ Service Management Software is currently being upgraded. We are a highly sophisticated Service Management education corporation teaching the art form of Private Service. We are also a seasoned Placement Corporation, placing our new and veteran Service Graduates with a 90% success rate. Our Publishing Company, Mansion Publishing has penned 18 Service Management Publications for our Students and our Employer Clientele. Starkey International provides the key that opens doors leading to the Private Service profession and a career in Household Management; and to experience "Service as an Expertise." Whether you want to enter the profession as a Household Manager, Estate Manager, Private Chef or Butler; or are looking for professional Household Management staff, Starkey International can "Make a Difference" in your life! To create a world-class Private Service industry in which Private Service Management is seen as an art form; continuing education and growth are valued; and standards of professionalism are recognized, honored and fortified.